KIRKSVILLE, Mo. -- Drag Illustrated's annual 30 Under 30 list will be revealed during its official press conference and magazine cover reveal at 1:30 p.m. on Friday at the Performance Racing Industry (PRI) show at the Indiana Convention Center in Indianapolis. The fourth annual list will be announced in the PRI Media Center, Rooms 116 & 117, and one-on-one interviews will be available with Drag Illustrated Founder and Editorial Director Wes Buck, as well as the 30 Under 30 honorees in attendance following the press conference. The cover of Drag Illustrated #139 will also be officially released at that time. Annually one of the most popular annual issues for Drag Illustrated, the 30 Under 30 list spotlights 30 top drag racing drivers, crew members, fabricators and industry insiders who are all less than 30 years old. The distinguished and highly anticipated list has become a coveted honor within the sport, highlighting the upcoming stars in all areas of drag racing. 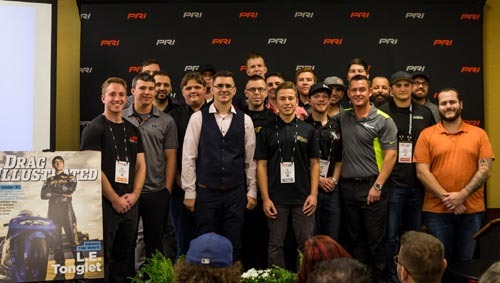 "It has been a thrill to see all the excitement generated from the Drag Illustrated 30 Under 30 list, making the press conference one of the highlights of the weekend at the PRI show," Buck said. "It is truly rewarding to honor the young stars in the sport and their families, and the support the 30 Under 30 list has received within the industry has been immense. We annually get thousands of submissions through the ZP Performance Steering Nomination Process and this was our biggest year yet. The interest in the 30 Under 30 list continues to skyrocket and that is evident with the amount of people who make their way to the PRI Media Center for the official unveiling. It makes me extremely excited for the future of the sport and I can't wait to honor this year's 30 Under 30 list at the press conference and in the pages of Drag Illustrated." 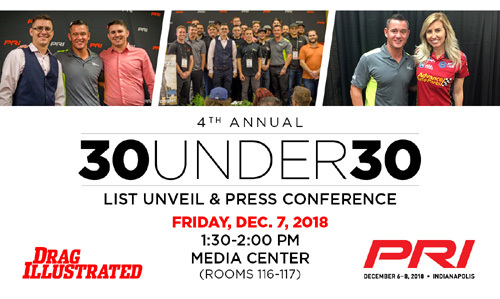 The event will also mark the second straight year the 30 Under 30 list will be released in its entirety during the press conference at PRI, and nearly all 30 of the honorees are expected to be in attendance. For those unable to attend the press conference at the PRI show in Indianapolis, the full event will also be streamed on the Drag Illustrated Facebook page starting at 1:30 p.m. on Friday. An official press release detailing the 30 honorees and their achievements in the sport will be provided immediately following the press conference. A group photo of 30 Under 30 Class of 2018 honorees will also take place on stage during the press conference.